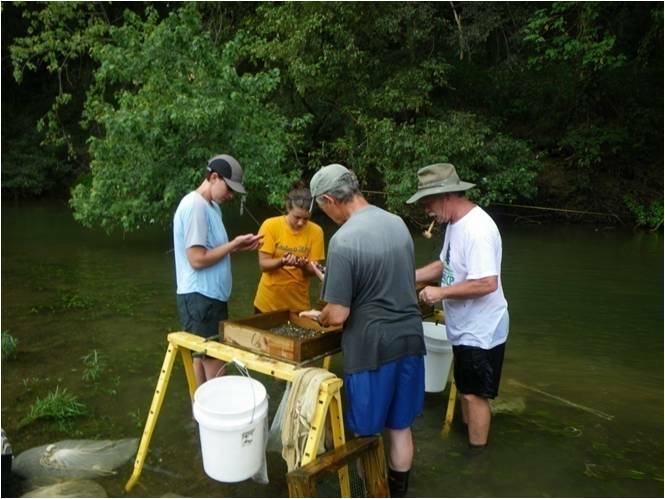 Graduate students in the Tennessee Cooperative Fishery Research Unit (TN CFRU) earn either a Master of Science degree in the Department of Biology or a PhD in Environmental Science. Annual stipends for research assistantships are competitive; all tuition and fees are waived. All graduate students must conduct research in addition to completing course work chosen in consultation with an advisory committee. All students in the TN CFRU are supported by research assistantships. Most students assist each other on their projects, thus increasing their research experience and opportunities. All students must deliver at least one seminar at the completion of their research, as well as complete a written thesis and successfully defend it in front of their advisory committee. Students frequently help write a technical final report to fulfill the requirements of the contracts that funded their research. Students usually are expected to give at least one talk about their research at a professional meeting. All students are encouraged to participate in professional societies and university functions.